Gravesend, Rochester, Medway and surrounding areas of Kent. Easy Oven Cleaning Gravesend Booking With One Call Does It All. Give us a ring on 0800 802 1540 and we will give you a quote, and book you straight in for an appointment (Mon to Friday 9am to 5pm). No waiting for a call back. Don't worry … you’ve found Gravesend Medway's number one domestic oven cleaning service! We do the full strip down deep clean using a method that is safe for you, your family and pets. OVENGLEAMERS Gravesend Medway has been providing superior oven cleaning services in Bracknell and across the UK for more than 12 years. Our professional oven cleaners are Fast, Safe and Thorough. They are professionally trained and insured. We are the big cooker cleaning specialists. Experts at cleaning AGA cookers and range cookers. We are AGA and Big Cooker Cleaning Experts. Ring us now. Or request a call back by clicking the button on this page. 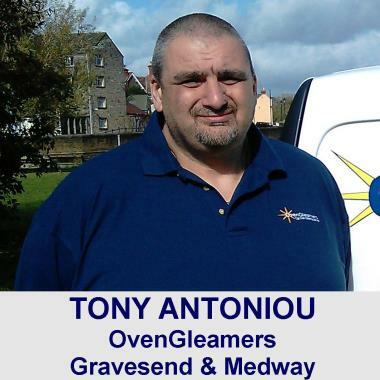 OVENGLEAMERS Gravesend Medway professional cleaning service provides a service to clean all sorts of ovens from the smallest single oven to the largest big range cooker. We also provide a service to clean hobs, extractors and splash backs to ensure that the complete job is done. I can't believe what a difference Tony has made to me oven. It looks like new." My oven looks brand sparkling new! I’m blown away! Wound highly recommend the service. Oven, hob & extractor clean in Gravesend.